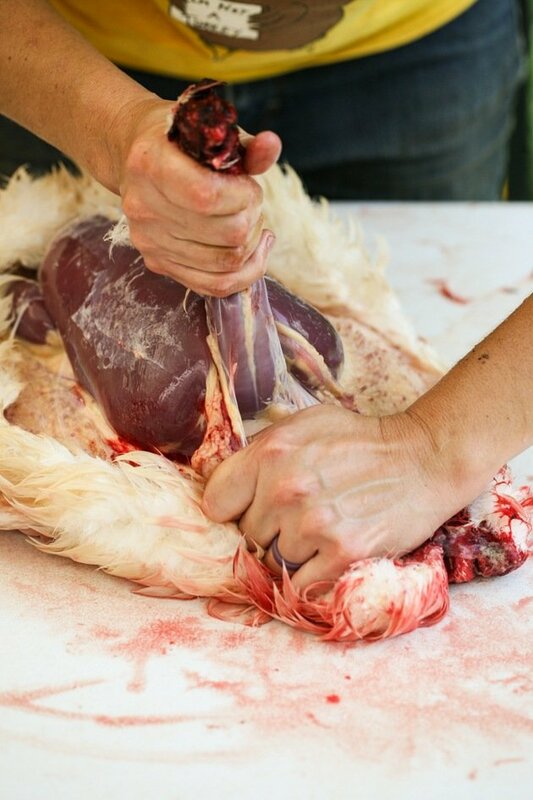 In this post you will learn how to butcher a duck. 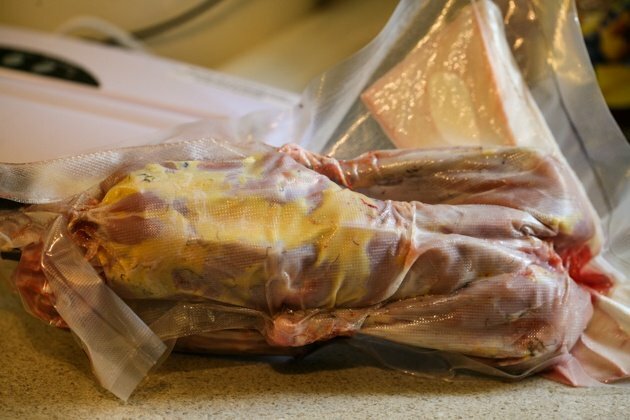 We will work through the process step-by-step and I hope this post will help you put some of your own home-raised meat in the freezer! You know what’s the best thing about homesteading… The neighbors. 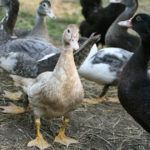 A couple of weeks ago I shared with you everything you need to know about Muscovy ducks and why I think you should consider those wonderful creatures for your homestead. Well, one of the reasons that I love them so much is that they are great mothers and they hatch their own eggs. I went from 3 ducks to 33 ducks in a matter of a couple of months! Another reason I love them so much is that they reach butchering size in three months and the meat is really great. So three months after the first eggs of the season hatched, it was time to butcher some ducks. The problem was… I love them so much! I seriously considered becoming a vegetarian, but that didn’t last very long. I also really needed to butcher some ducks otherwise the situation would get out of control because the mamas of those ducks were already sitting on the next nest. So when my neighbor called to say they were going to butcher their ducks, I jumped on the opportunity to help, hang out with wonderful people, butcher some of my own ducks, and show you how to butcher a duck! I also secretly hoped that they would do the killing for me… Once the animal is dead, I don’t mind getting my hands dirty, but the killing… It’s not easy, man. We got together early in the morning. Between the three of us mothers, we had 13 kids running around… All homeschoolers, so you bet we made it an educational event. The world is really the best classroom and what better lesson can you get than how to be independent and put food on your table? Algebra is fine, but you gotta eat first. My ducks free range. So the night before butchering, when I fed them I picked up a few. It would be hard to catch them during the day when they roam around, but at feeding time, they all gather by the feed room. I throw the feed on the ground and then I can pick whichever I want to butcher. I placed three of them in the dog kennel to take to my friend’s house in the morning. Generally, it’s better to not let them eat for 12 to 24 hours before butchering. It’s easier to deal with the guts when their stomach is empty but it’ll be ok even if you do let them eat. 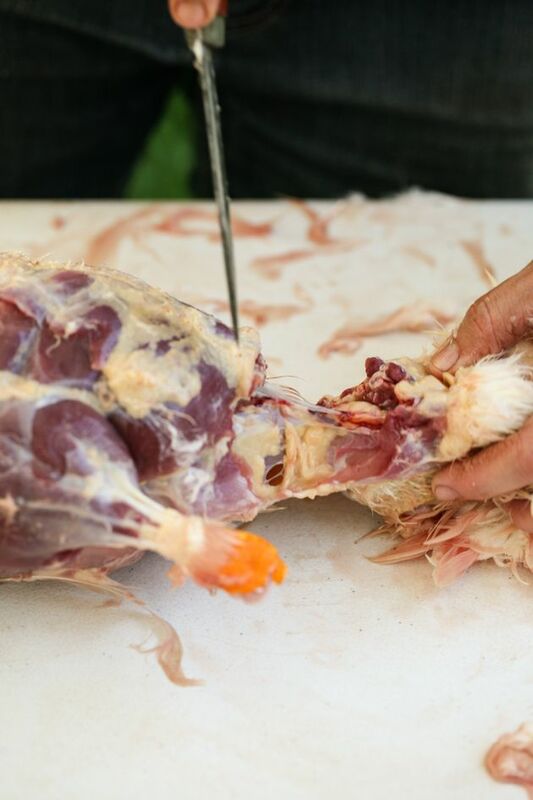 Duck butchering is pretty much the same as chicken butchering. 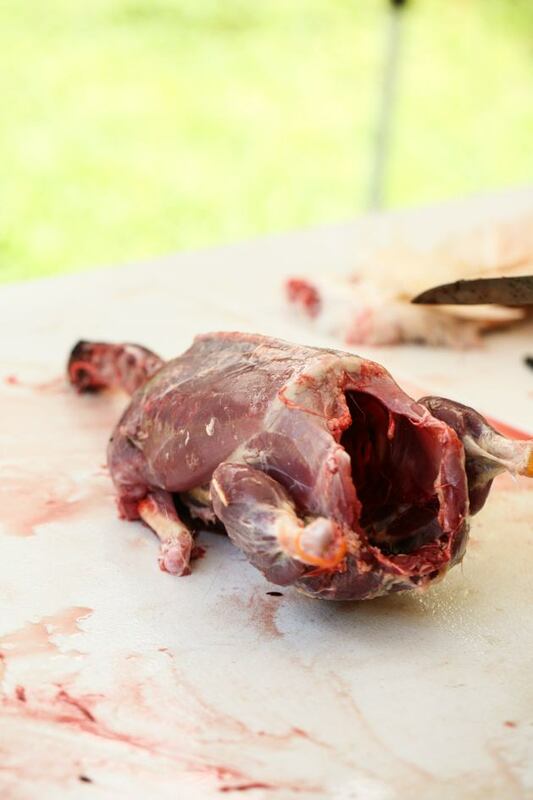 There are a few ways to kill your duck but the way I show here is the least messy and the most humane in my opinion. 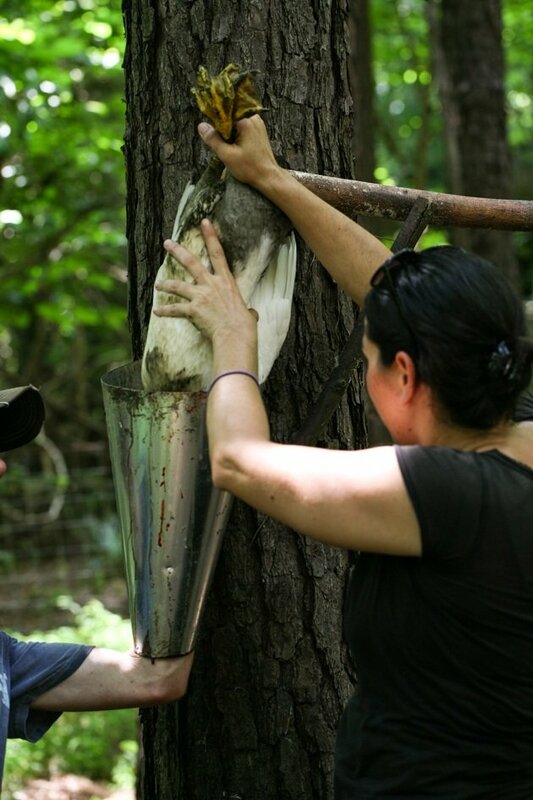 We placed the duck in the killing cone that is attached to a tree, the same cone we use for the chickens. 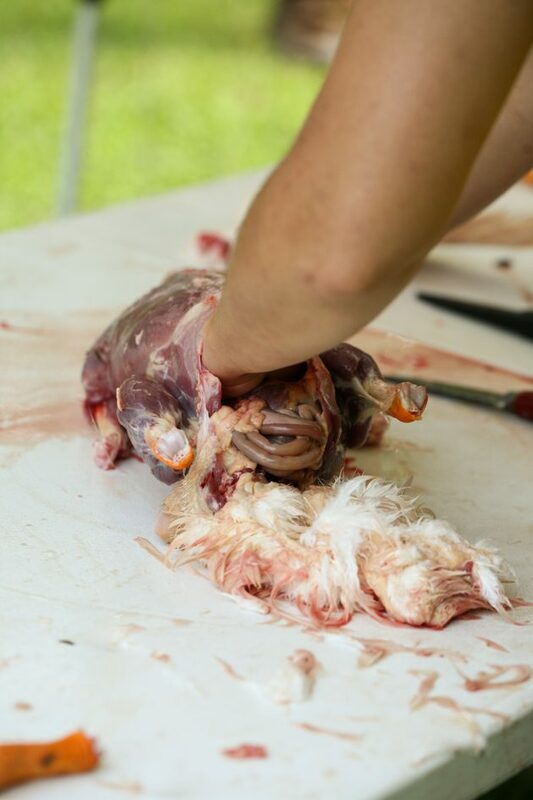 Muscovy ducks have claws and they can really hurt your hands and arms, so hold them from their legs with their head down when you pick them up (like in the picture above). They will calm down just like chickens do. And make an incision right above the jaw line. This will cut the main artery. 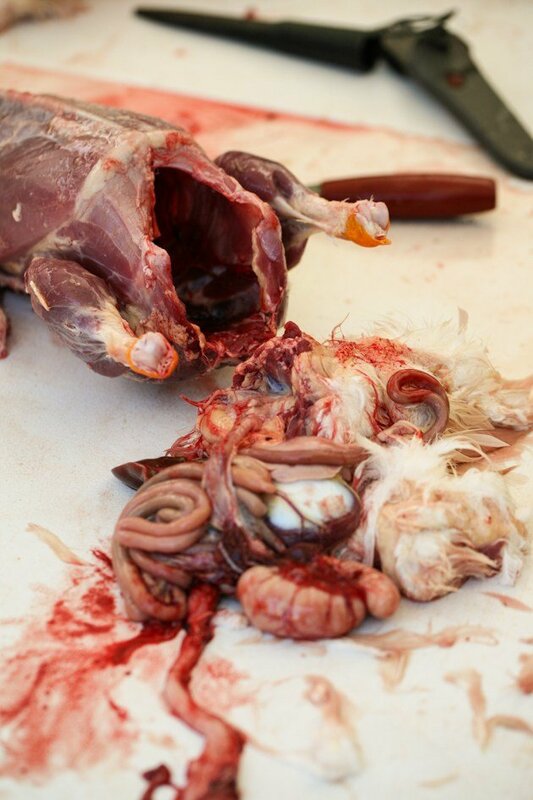 The bird will bleed to death without feeling a thing and the convulsing of the body will push most of the blood out. You want to make sure your butchering knife is super sharp and that you make one good, quick, and fast cut. Some people chop the duck’s head off with an ax, we did that with the first couple of ducks but I think it’s much messier. 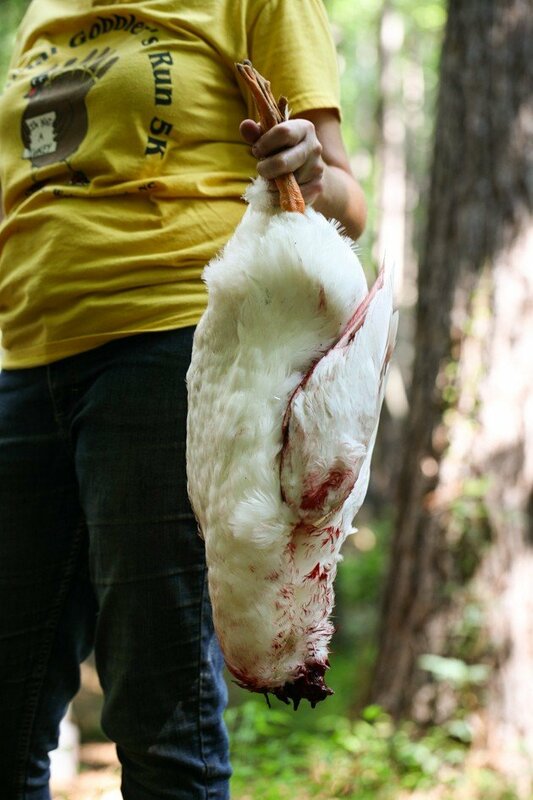 Blood was flying all over the place and the boys had to hold the duck to the ground until the flapping stopped. 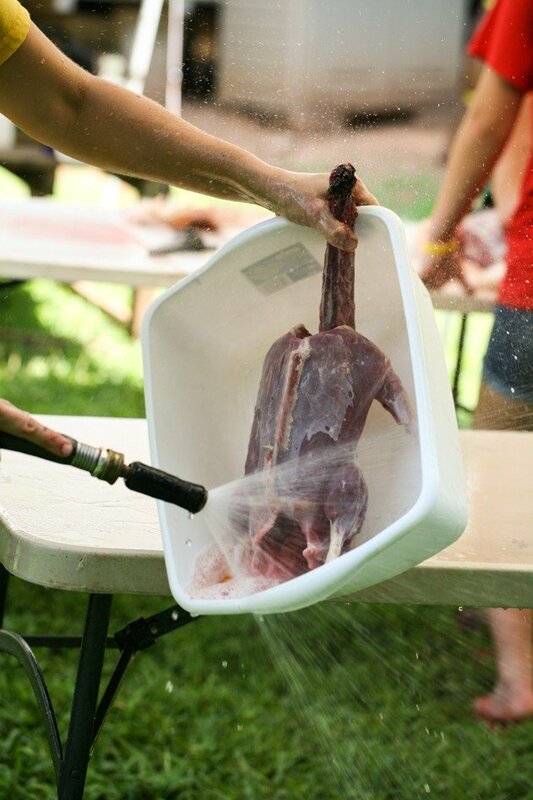 This is much easier and cleaner in my opinion and it’s a humane way to kill the animal. Let the blood run out for a couple of minutes. you can place a bucket on the ground to collect it if you want to keep things clean. The body of the duck will keep flapping for a few minutes. This is normal, the duck is not conscious anymore and doesn’t feel a thing. After the flapping stopped, we used the ax to remove the head. This is what we got so far. This is actually not my Muscovy but my friend’s Pekin duck. 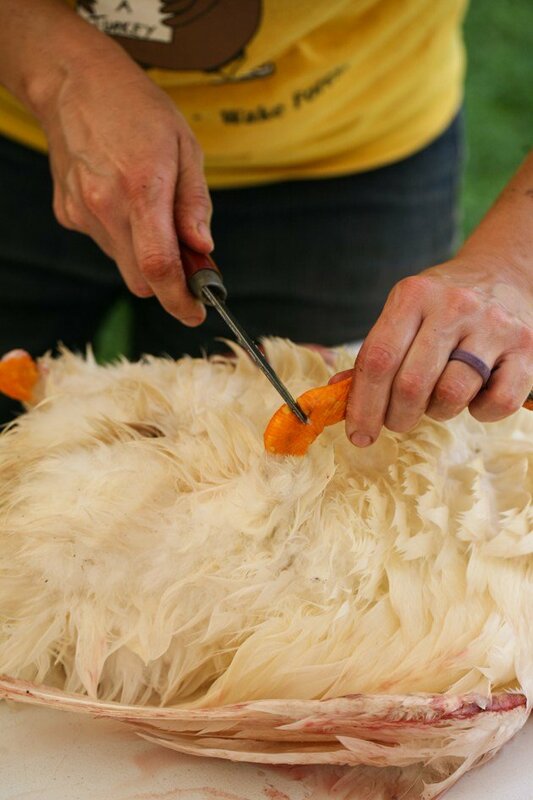 Since I am behind the camera, you’ll see her butchering her Pekin. It’s the exact same thing that I did with my Muscovies. We decided to skin the duck instead of plucking it. I’ve actually never plucked a duck but I’ve heard more than one person complain about the nightmare it is. 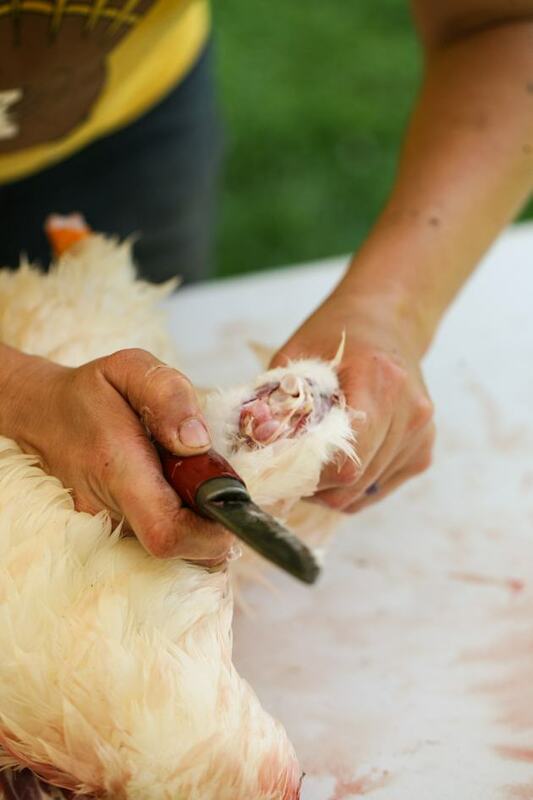 If you decide to pluck, you will have to have a large pot of water heated to 155 F or so and then scald the bird. Just dunk it in the water and move it around for a minute or so. You can see how we do this with the chickens here. 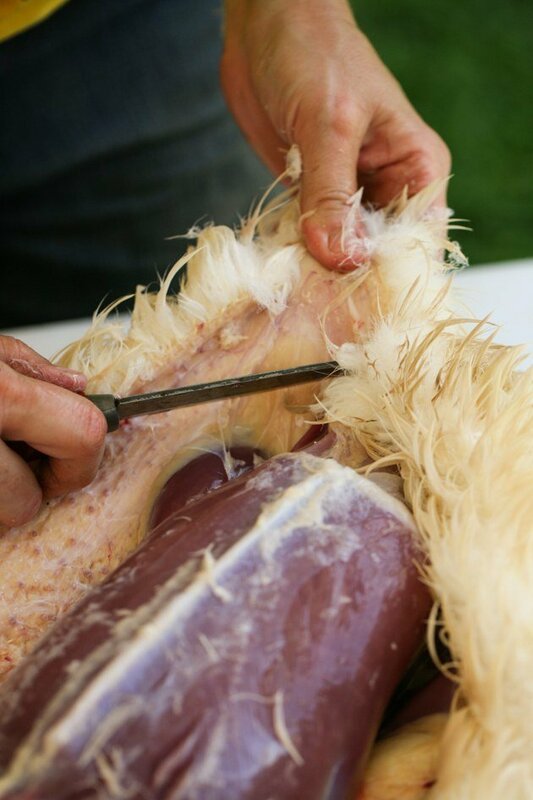 Since we were skinning, it’s easier to work on the duck if it is wet so we gave it a quick rinse. 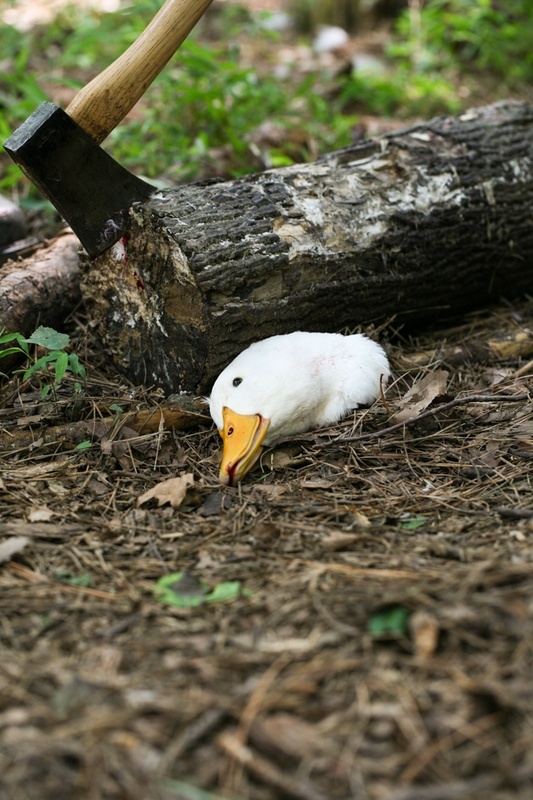 If you’re wondering about the blood on the duck it’s because it was one of the couple of ducks the boys killed by chopping the head off with an ax. 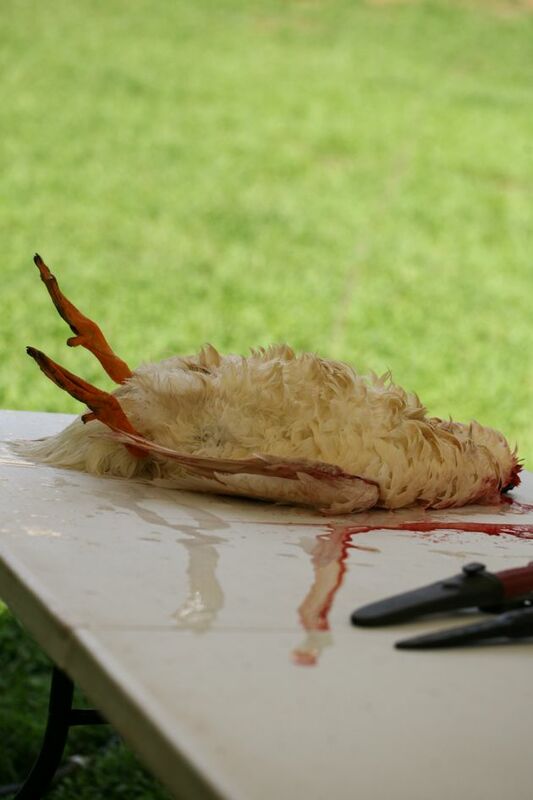 Again, blood is everywhere in that method, that’s why the duck is dirty. It’s important to make sure you have a clean place to work with a source of water and a couple of sharp knives. Also, make sure you have a bucket for the innards and feet and some plastic bags to put your butchered duck in before you take it to the fridge. Then bend the leg and twist it to remove it. 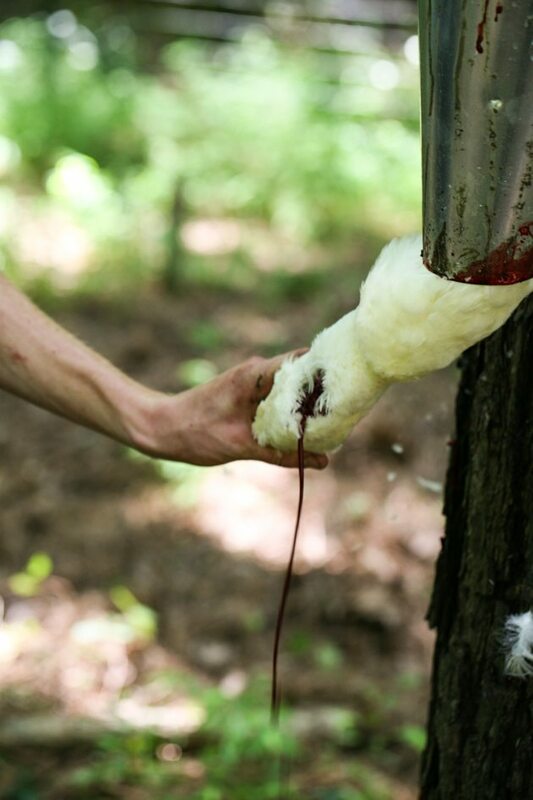 From here, we mostly try to use our hands and just get a little bit of help from the knife if tearing the skin is too hard. The reason that we prefer using our hands is that we don’t want to cut into the meat by accident. Stick your thumb between the neck and the esophagus and wind pipe and pull them apart. 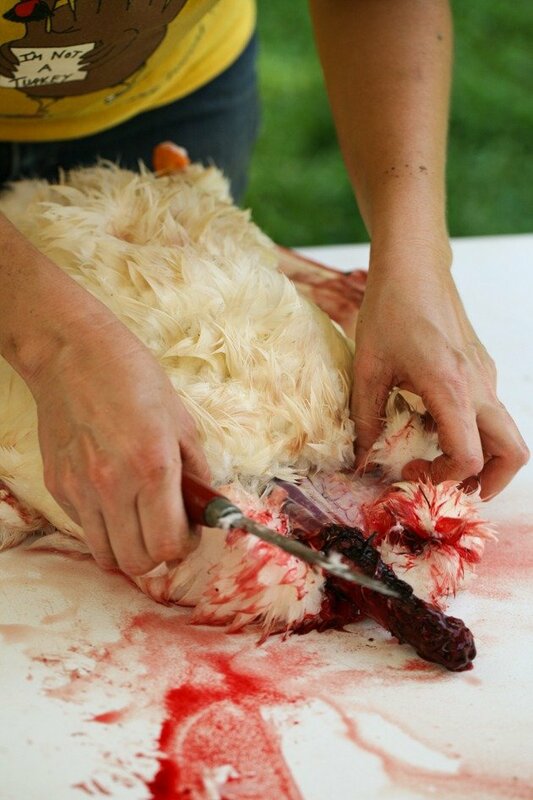 Pull it with your hands and use the knife gently if you need help to separate it from the meat. 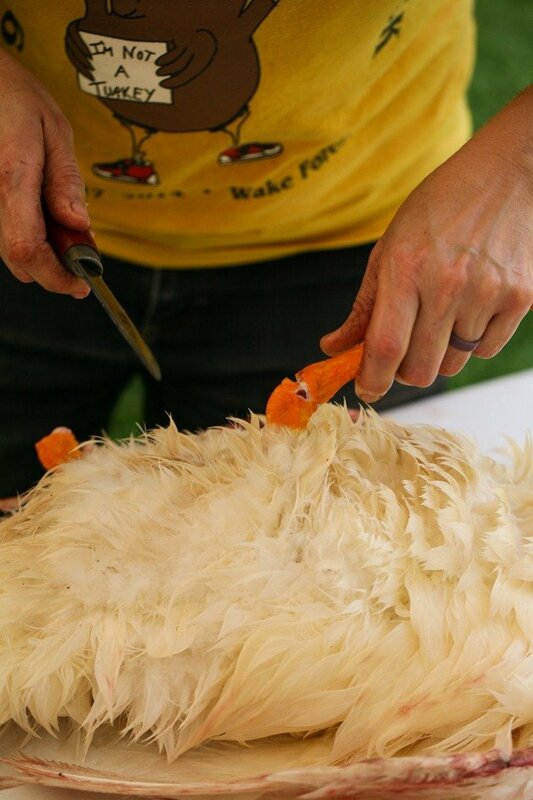 Gently, start working around the legs and wings. Until you manage to remove it. 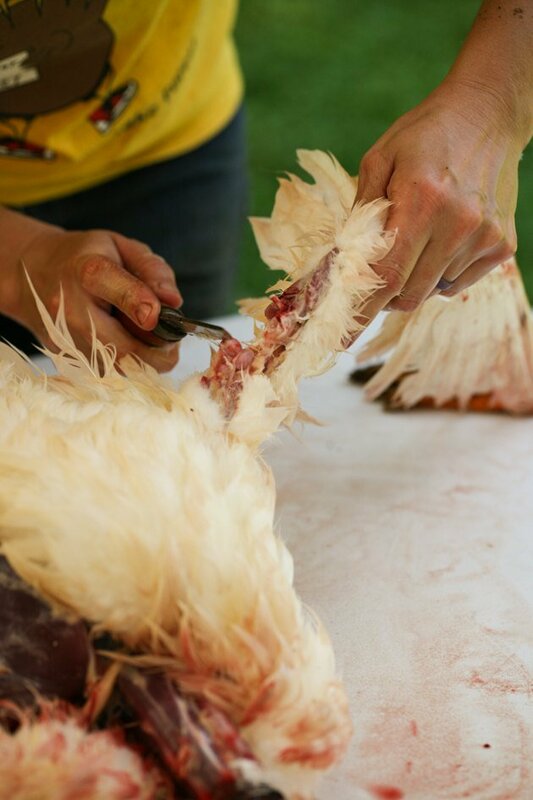 Go back to the neck and start removing the skin around it and towards the back of the duck. If the skin and the feathers dry up, use your hose to wet them again. Keep working all the way to the tail. There is not a lot of meat on the lower back, so I found that I needed to use the knife more in that area to help me separate the skin. And separate it. 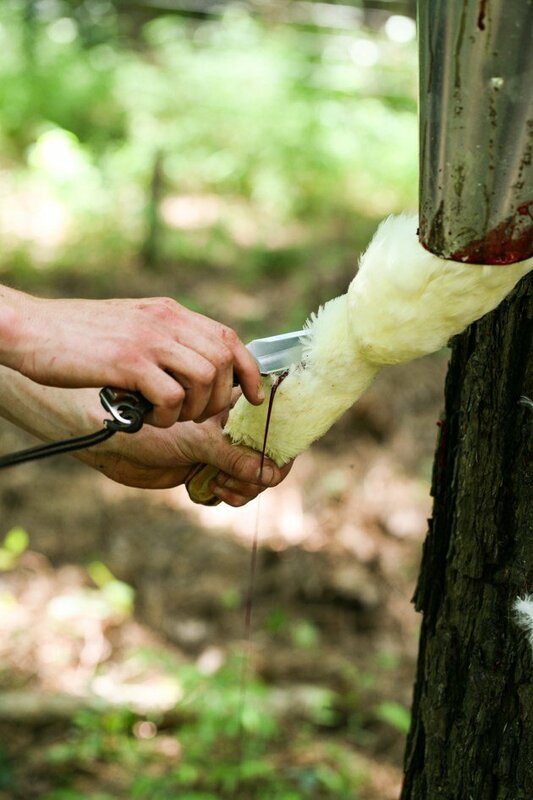 We then keep cutting around the vent carefully so as to not puncture the intestines. 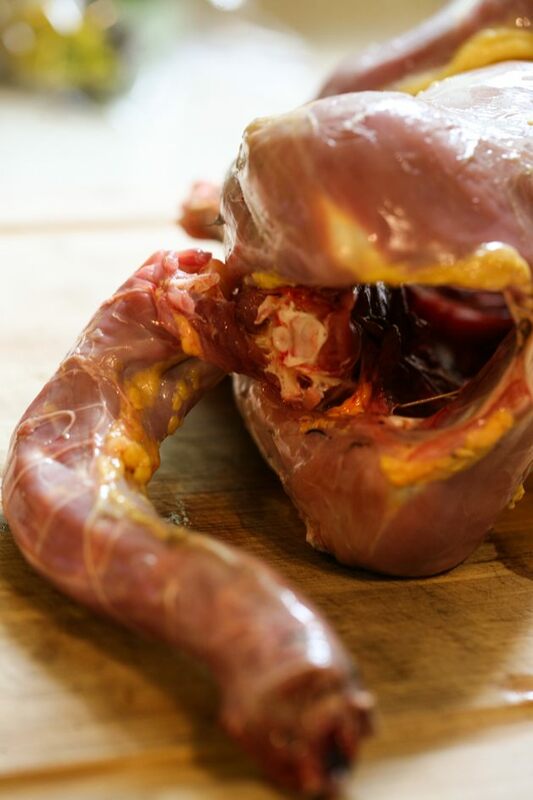 Now flip the duck so it lays on its back and you’ll be able to see the innards. 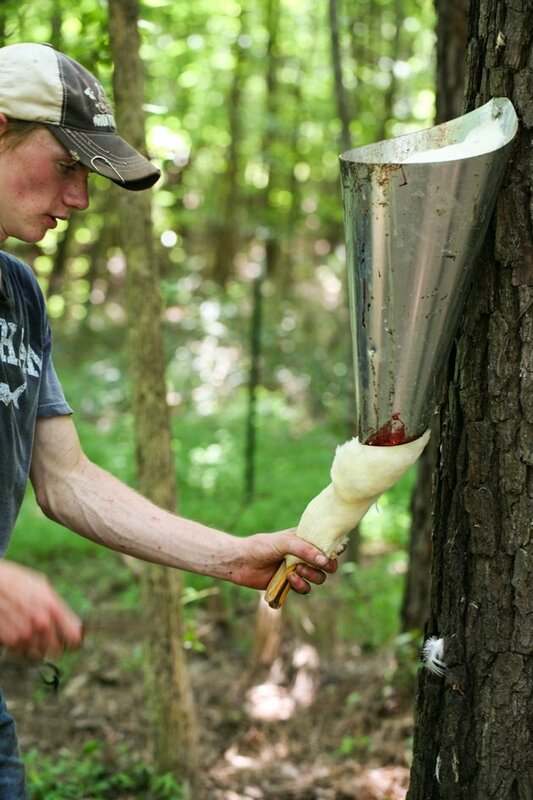 You can hook your fingers around the esophagus and wind pipe and pull the whole thing out. I keep the liver and the heart and throw the rest in a bucket. I’ll have a recipe for livers and hearts with onions on the blog soon. It’s soooo good! 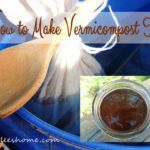 Whatever is in the bucket goes to your compost pile or you can bury it in the garden. 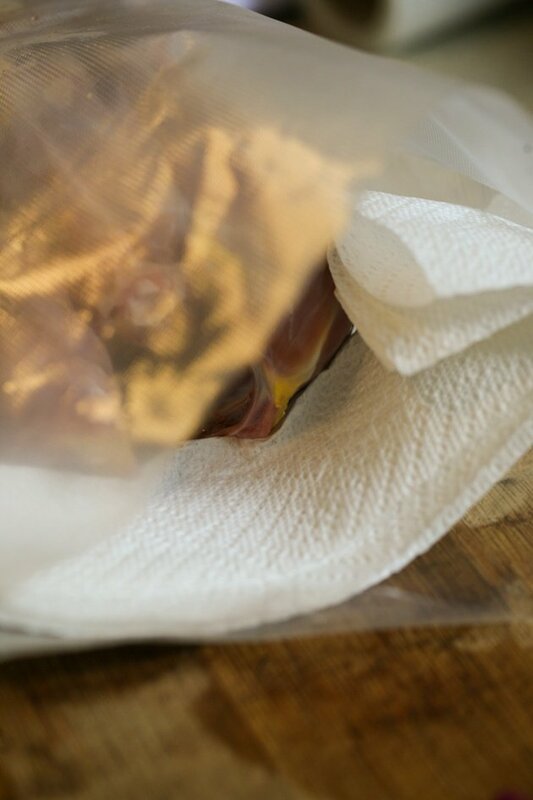 Stick it in a bag and off it goes to the fridge for 24 hours so the muscle tissue will tenderize. I separate the neck from the body so it’s easy to package it (I still package the neck, just put it next to the body in the bag). I wash the duck again and then pat it dry with a paper towel. Then place it in a vacuum bag. And now, even though we dried it with a paper towel there is still moisture there that will prevent the bag from sealing right. So what you do is place a paper towel across the opening of the bag. Once you start vacuuming the moisture that the machine will pull will be absorbed by the paper towel and it will be able to seal the bag. 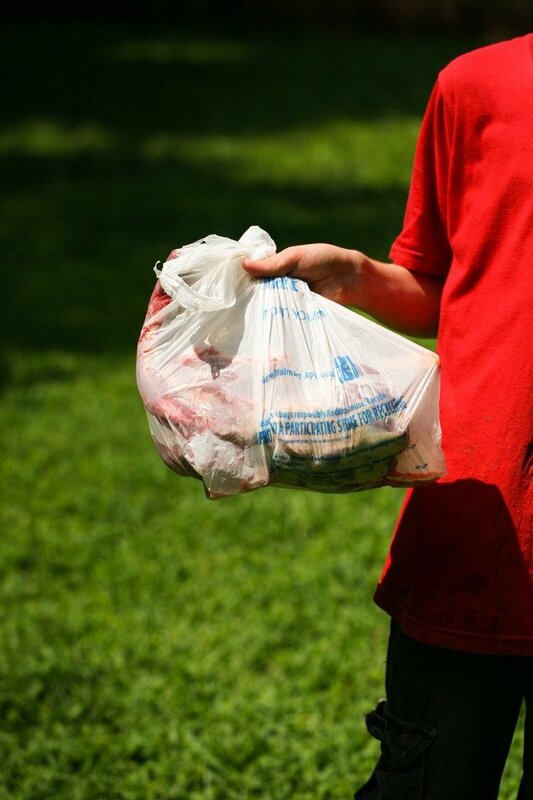 It’s a neat trick that will help you save your food for longer. 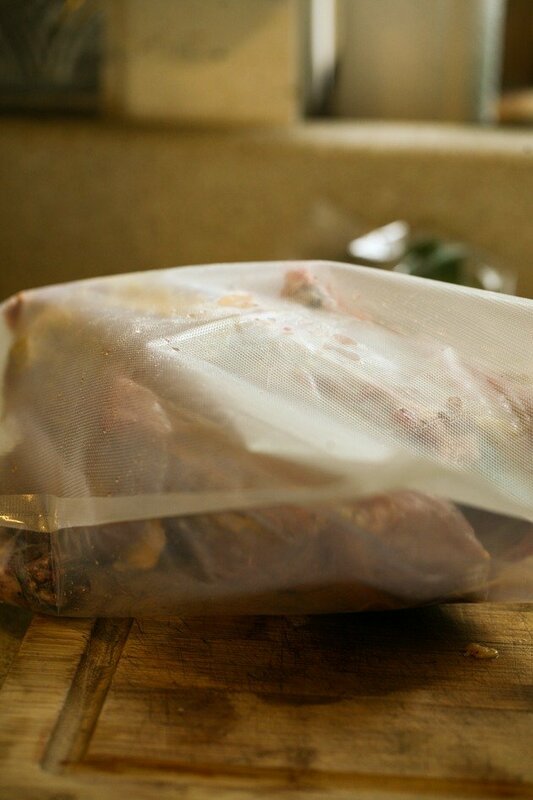 You can do this with fruit or vegetables or anything else you vacuum seal. This is our end product! It’s a lot of work but totally worth it. I have to note that I did end up killing my own ducks. Once they were head down in the cone, it felt wrong to let someone else do the hard work for me. I watched them hatch, I cared for them, and I felt it that it was my responsibility to kill them. The meat is great! It’s kinda like the dark meat of a chicken. 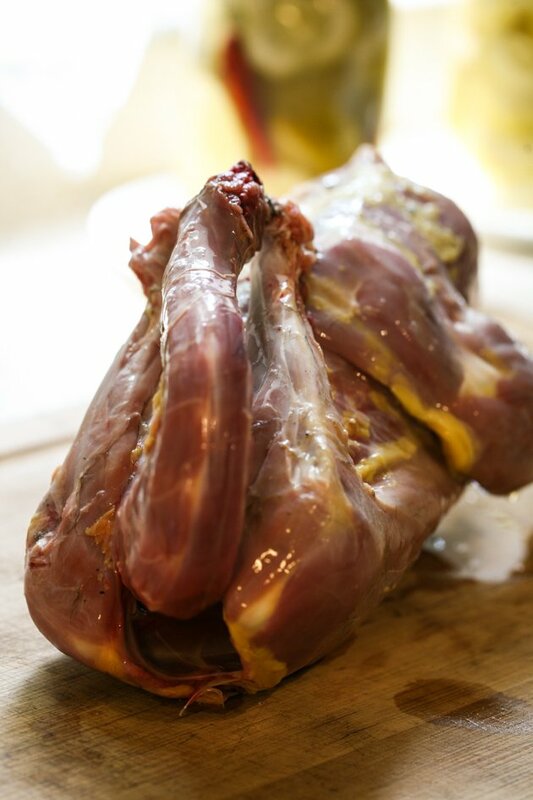 I’ll have a couple of recipes here on the blog for duck meat soon. I was surprised to see that my three-month-old Muscovies were almost as big as the Pekin which are meant for meat production. I am not sure if there is a difference in the taste, though. I should probably try a Pekin duck sometime. I hope this picture tutorial is helpful! 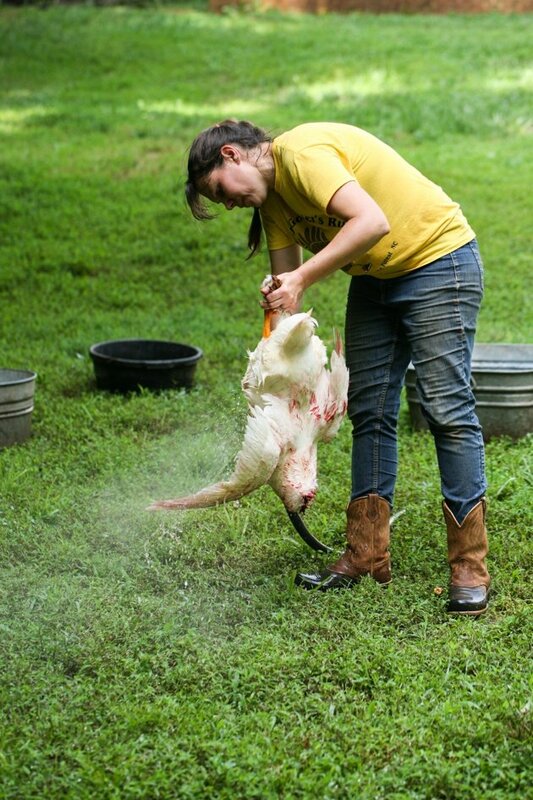 Do you raise ducks for meat? Tell me about your experience in the comments below. Years ago I knew a woman who kept a old refrigerator for “Hanging Meats”. 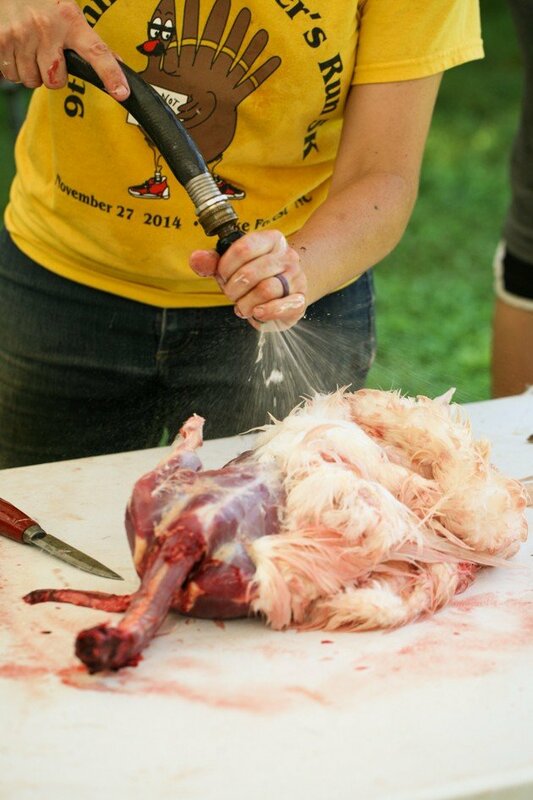 Pig, Deer, Ducks, Chickens…..She would butcher the animal just like you did but she would hang it to drain all the extra blood out of the body…..and the process (just like a cold house where meats hangs) is part of the process of tenderizing the meat. I butchered a duck that was attacked by a visiting “city dog” that attacked it, the duck belong to a very famous marine biologist here in the PNW , I processed the duck and fried it up for din-din(teaching my daughter how to process a duck)…….It didn’t make me the most famous person on the island… but it was a reminder that we are earth connected and nothing should ever be wasted. Your doing life in a “Good Way”, and that connects you to earth & spirit ….and your children. My prayer is that your children will follow your ways, the ways of our ancestors and our G-d…the master of the most beautiful garden to bless us with all that we need. Thank you Sheri! I crave this connection. I am not sure why I am this way. I see most people around me distance themselves further and further away from nature and this way of living and I just look for ways to go back in time, LOL. Things like basket making, hide tanning, food production and other primitive skills just fascinate me. My kids have their tablets that their grandma bought them and sometimes if they have a hard time with a game they come to ask me for help. I look at the thing and often tell them that there is no way for me to help them, go ask your sister or figure it out or play another game… Not only I have no clue what is going on in those games I also have no desire to figure it out, LOL. I hope they won’t hate me for that later!! I still have my backgammon board and I use it and teach children how to play the game. I do a little garden mentoring and after lunch I have been teaching a little 8 year old the game, a week ago all through the game she kept saying “I’m going to lose, I’m going to lose…over and over…….and she won the game. She went home with a 5 gallon bucket full of fresh garden veggies that she harvested and she won the game! Kid was ecstatic! Amazing Sheri! Kids love hanging out with adults, especially in the garden. THANK YOU!!! 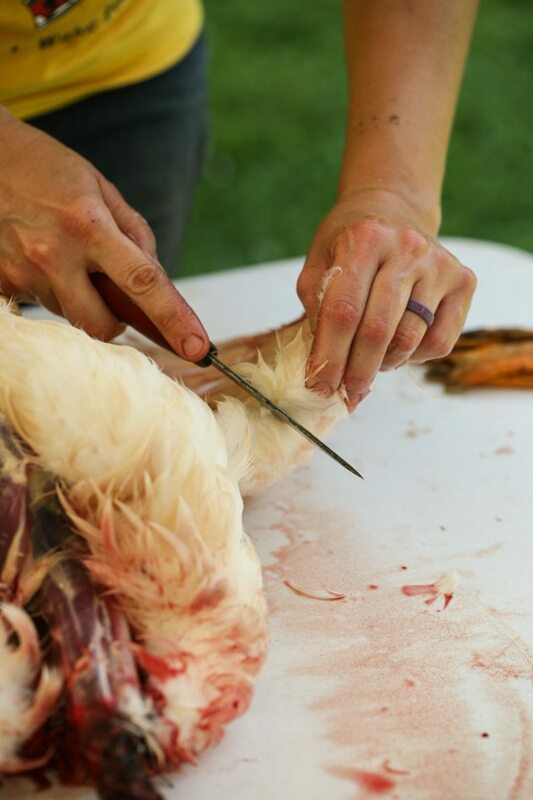 I am looking at butchering a LOT of Muscovies in the next week or so. I am a city girl with a country soul, so this is a first for me…just like the pigs last year and rabbits before that. I am like you, the butchering doesn’t get me the killing does. You’ll do fine! The first time is hard but after that it’s ok. Thanks for stopping by! Getting the feathers off, I believe that’s done with wax. Am I wrong? You know, someone on Facebook said that she adds wax to the large pot of hot water and let the duck sit there for a few minutes. She said it helps the feathers come off much easier. I’ll have to try this. Thank you for this Liz! Will look into all the links in the evening. Very in depth guide! Thank you so much for sharing. 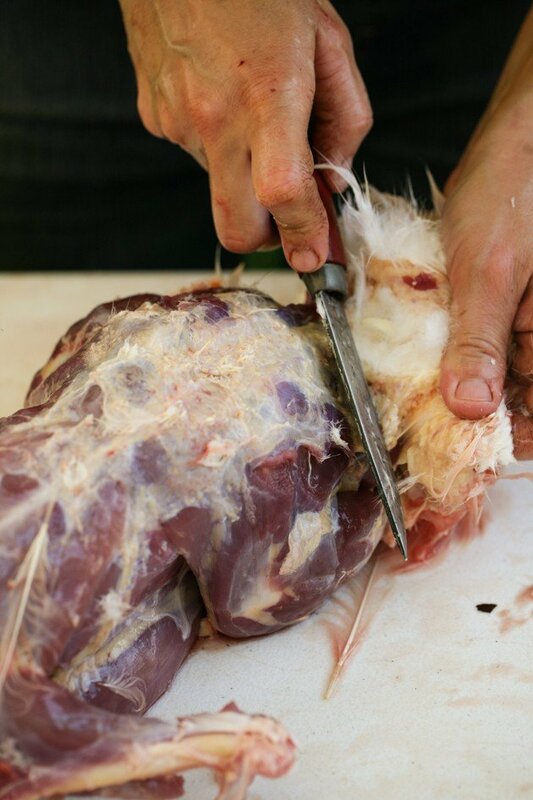 It’s great for people to know every step of the process when it comes to butchering their own meat. Thanks for taking the time to write this, Billy! And thank you for stopping by.